Above & Beyond Assisted Living is licensed by the State of Texas as a “B” level facility. This means we provide any level of care needed. We have doctors, nurses, and podiatrists in our staff. 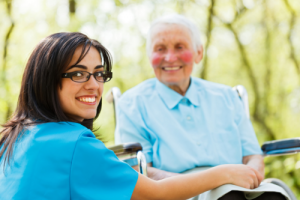 We also offer home health care, rehabilitation, physical and occupational therapy, and hospice care services to help our residents to age in place well. Our facility is even connected with pharmacies that deliver health products and supplies for your loved one’s needs. We proudly uphold our name “Above & Beyond”– The Bed & Breakfast of Senior Living. Our staff, our facilities, and our Assisted Living Services in Conroe, Texas create a quality of life that you would want for someone you love during their senior years.